We’d love your help. Let us know what’s wrong with this preview of Elevated by Harvey Araton. Howard Beck. Marc Stein. Jonathan Abrams. Chris Broussard. Ira Berkow. George Vecsey. Mike Wise. Selena Roberts. Lee Jenkins. All have graced the pages of The New York Times, entertaining readers with their probing coverage of the N.B.A. : a stage on which spectacular athletes perform against a backdrop of continuous social change. 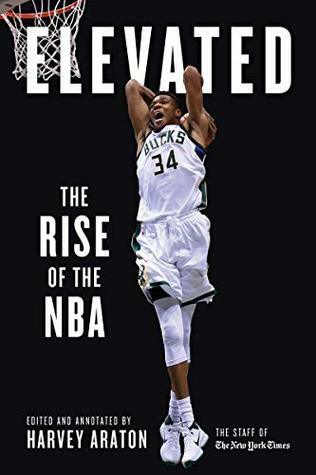 Now, their work and more is collected in a new volume, edited and annotated by Hall of Fame honoree Harvey Araton, tracing basketball's sustained boom from Magic and Bird to the present. Elevated provides a courtside seat to four decades of professional basketball. Both the iconic moments and those quieter, but no less meaningful times in between are here, from Wise riding around Los Angeles with a young Kobe Bryant on the eve of his first All-Star Game, to Stein declaring Giannis Antetokounmpo's "unspeakable greatness" to the world in a riveting profile. Rather than simply preserving the past, Elevated reexamines and further illuminates hoops history. This expertly curated collection features exclusive original writing by Araton, revealing candid exchanges with NBA greats that didn't make the original newspaper edit and tracing the rise of a worldwide phenomenon from a contemporary vantage point. To ask other readers questions about Elevated, please sign up.